The Nomad is a modular system for creating partitions designed by Mio. What sets them apart from other partitioning setups? Well they're made up of tons of little recycled-cardboard pieces that fit into one another in order to create your desired wall shape. You can even create openings that you can walk through, ala a door. 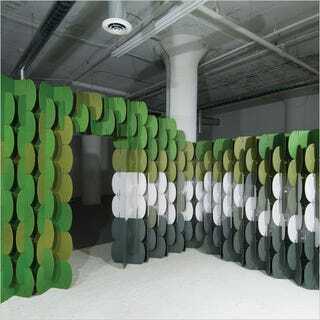 The pieces, that are extremely light and fold flat, are made out of recycled-cardboard and come in six different colors. However, 24 pieces cost a whopping $56. So if you were to create a wall similar to the one in the picture (which contains somewhere in the vicinity of 112 pieces) it would end up costing around $280. Although after checking out the prices for wardrobe screens at Cost Plus this doesn't seem quite as bad and they're portable.